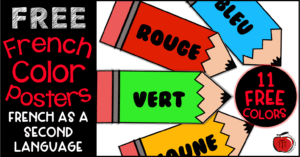 Do you teach French colors to your students? In my school district students start learning French in fifth grade. 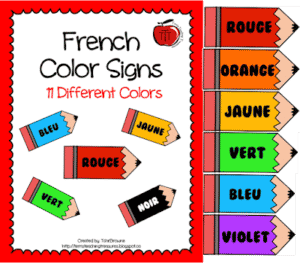 One of the very first things they learn about are the colors and French color signs are a great reference tool. 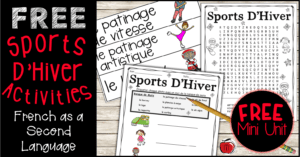 There are so many fun activities you can do to help your students learn the names of the colors in French. Your students will be more confident if they have tools to refer to during work times. 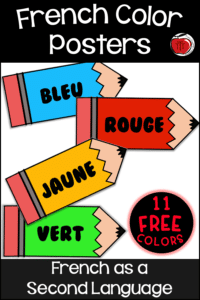 I display these French color signs in the room so students can refer to them if needed. This makes it possible for all my students to feel confident and successful. 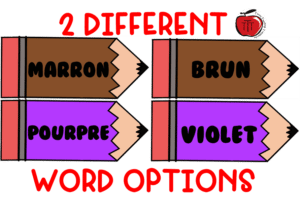 Brown and Purple have 2 different ways of saying the word. This allows you to choose which one (or both) you will teach your students! 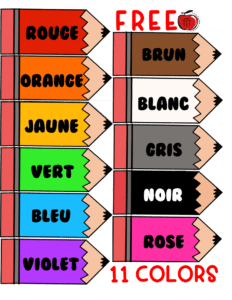 Because I know your time is valuable I have made these French color printables easy to prepare. All you have to do is print, cut, (laminate if you prefer) and display. Click on any picture or right HERE to get your free copy today. 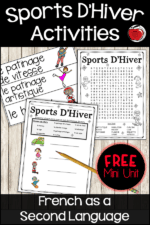 Do you want to teach your students about winter sports in French? 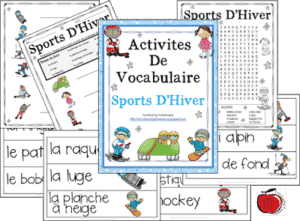 I have also created FREE activities to help your students learn the French vocabulary for winter sports. This is always a class pleaser!